For Craigkelly we recommend the DM log for strong signal areas, the Log36 or the Yagi18K for medium signal areas, or Yagi 18A or XB10A for poor signal areas, the latter aerial being particularly well suited to loft mounting. 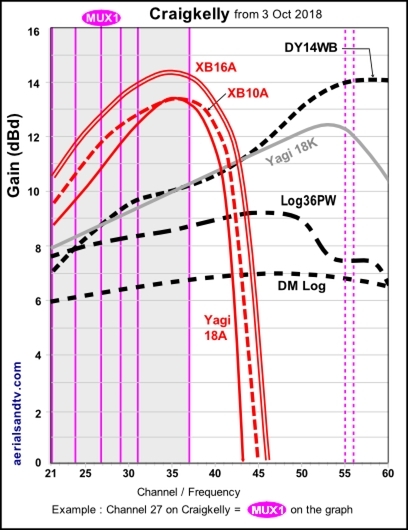 The XB16A is for those with the most marginal signals. The dimensions and test performance of the aerials can be found on the relevant tables. The close up on the right shows (from the top) the digital transmitting arrays for CH39 and CH42 MUXES, the analogue transmitting arrays and the other digital MUXES (under the glass fibre shroud), the FM radio transmitting arrays (note the mixed polarity) and at the bottom, well to be honest I`m not sure what they were ! 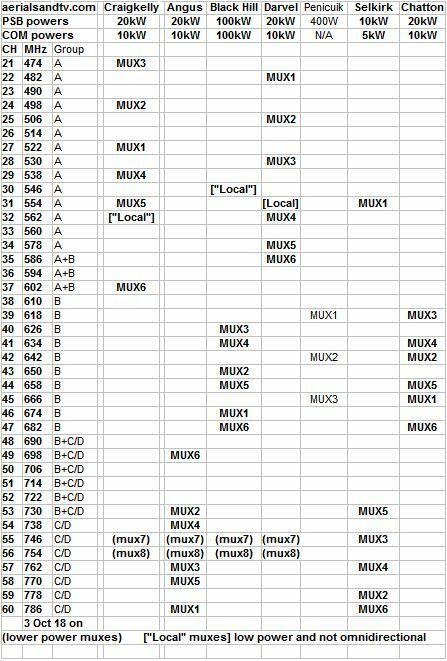 Note how after the 700MHz clearance on 3 Oct 18 only MUXES 7 & 8 (both due to be turned off between 2020 and 2022) are out of the A group, so those in poor signal areas could swap to an A group and get significantly more signal. For Craigkelly`s frequencies see its channel allocation guide. This table also includes the same information for some of the other transmitters receivable in the area, namely Angus, Black Hill, Darvel, Penicuik, Selkirk and Chatton. This data can be of great use in determining possible causes of co-channel interference and / or alternative transmitters to try if Craigkelly fails to give an adequate signal, see the importance of “Line Of Sight”. Note how the transmissions “dovetail” together in an attempt to minimise co-channel interference. The Channel Allocation Guides can also be very useful in the diagnosis of co-channel interference problems and can also be invaluable if you are trying to find a spare channel for a modulated output (e.g. for a Sky box or CCTV system) to be added to your TV setup/distribution system without suffering from co-channel. 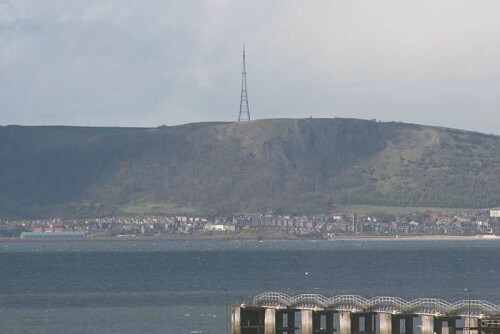 The transmitter over looks the town of Burntisland which has rather an interesting history form the railways point of view. From 1847/1848 the town was the Southern terminus of the Edinburgh & Northern Railway which extended up to Perth and Tay Port. But this was despite being separated from its namesake by 6 miles of water in the shape of the Firth of Forth ! The trains could travel straight onto the pier for transhipment onto ferries to complete the journey to the Scottish Capital. This anomaly came to an end with the opening of the fabulous Forth bridge in 1890, although by then the Edinburgh & Northern had been absorbed by the North British Railway. Incidentally the aforementioned Forth Bridge was jointly owned by no fewer than four railway companies, namely the North British, the North Eastern, the Great Northern and the Midland ! Craigkelly transmitter was built in 1971, or rather more accurately it was rebuilt on its present site. The tower was originally in use at Emley Moor in 1956 by the IBA, as the first of the three transmitters to have been in existence there. The tower is situated about 8 miles North of Edinburgh, overlooking the Firth of Forth and the most famous bridge in the world. Its population coverage is about 1 million and it uses nine small repeater transmitters to improve its coverage in fringe areas. The site altitude is 182m and the structure height is 125m with the transmitting arrays possibly another 10m or so above that, see How High Is High ? Being a "main transmitter" it is horizontally polarised. Craigkelly was originally an A group it then became a K group (or wideband) at digital switchover, but it`s now reverted to an A group (excl MUXES 7 and 8 which are due to be switched off between 2020 and 2022 anyway). (before the 2011 digital switchover it was only 4kW and 2kW respectively). There is one ”Local” channel allocated to Craigkelly, CH32, which is used mainly for a local Edinburgh TV station. In addition, there are two lower power HD MUXES (7 and 8) on CH56 and CH57 (both at 16kW) the latter two are due to be switched off between 2020 and 2022. 700MHz clearance occurred at Craigkelly on the 3 Oct 2018 when it reverted to its original A group (excl M7 & M8), though most K group or wideband aerials will continue to work OK. Even more positively, those in poor signal areas will find swapping to an A group aerial will pay dividends. Also check Craigkelly`s nine small repeater transmitters, the map also shows and Black Hill`s fifty five repeaters.